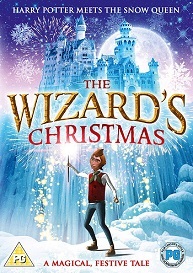 The Wizard's Christmas is released on DVD November 7th And to celebrate we have a great competition for you and 3 copies on DVD to give away. Long ago in a faraway place, a young wizards apprentice, Alerik, discovers a pathway under the wall of thorns that surround his land to a shining city alive with the magic of Christmas. While there, he meets Perin the niece of the Wizard of Christmas - who tells him the tale of how, long ago, Aleriks master broke the Staff of Christmas, dividing their people and splitting the land in two. But all is not as it seems and Alerik must find a way to right the wrongs of the past to restore the magic of Christmas, before it is lost forever.